We offer emergency shelter to women, as well as four supportive and affordable housing residences. Our goal is for every woman to have a safe, affordable place to call home so she may reach her full potential in a caring community. We have more than 65 full and part-time staff and almost 300 volunteers. Every year, we provide more than 140,000 nourishing meals. Cornerstone provides basic needs and a variety of support programs, such as spiritual support, safety planning, mental health and addictions support, age in place supports for senior women, life-long learning centre, employment counseling, crisis counseling and housing search. Ongoing critical and urgent needs for our emergency shelter and four supportive and affordable housing communities. This year, thanks to the extraordinary support of our community, we opened our new 373 Princeton Ave. project. This building is now home to 42 women moving beyond homelessness into hope, healing and home. 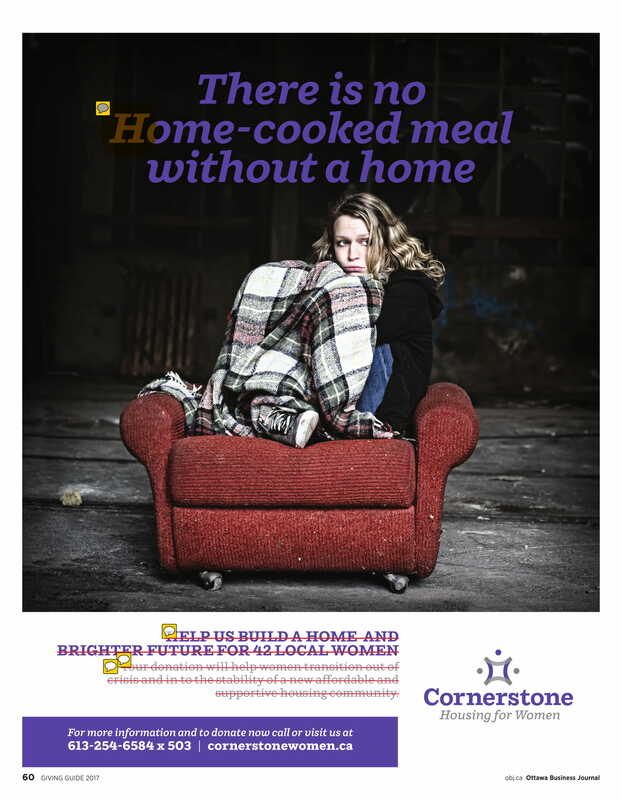 With an emergency shelter, in addition to four residences, we look for the help and generosity of the community to truly make Cornerstone a warm and loving home for almost 500 women each year. If you feel inspired, please give at www.cornerstonewomen.ca. Sorting food donations and helping prepare the nutritious meals that fuel Cornerstone women. Providing transportation and accompaniment for appointments, housing search and moving. Organizing activities like arts and crafts or games nights, off-site adventures and exercise programming that keeps every day joyful and new. We welcome new ideas and projects to accommodate your special skill sets! We welcome everyone to start the conversation about volunteering at Cornerstone. The Annual Garden Party & Fashion Show, hosted by Sukoo Sukhoo, has become our signature event. Held every June, this fundraiser contributes $25,000 annually, all of which goes towards providing shelter, meals and counseling for the women who come to Cornerstone. Whether it is a garden party, fashion show, a Celtic Kitchen Party, or a foodie event, Cornerstone offers signature special events throughout the year. To learn more, please visit www.cornerstonewomen.ca for updates. Cornerstone's Young Professionals Advisory Board members contribute to the success of Cornerstone Housing for Women through volunteering, advocacy and fundraising efforts. YPAB members deepen their understanding of the roles of non-profit board members, plus learn the value of fundraising. Members come from a range of industries and backgrounds but are driven by their common goal of bettering their community and educating others about women experiencing homelessness in Ottawa. YPAB members expand their social circle while doing good.